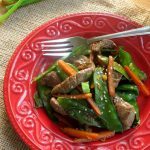 Sesame Beef Stir Fry with vegetables in a finger-licking good ginger soy sauce is the perfect busy night recipe. A complete dinner is ready in less than 30 minutes and there’s just one pan to clean! It’s an absolute dream of a dinner that can be easily customized for your family and based upon what you have on hand. 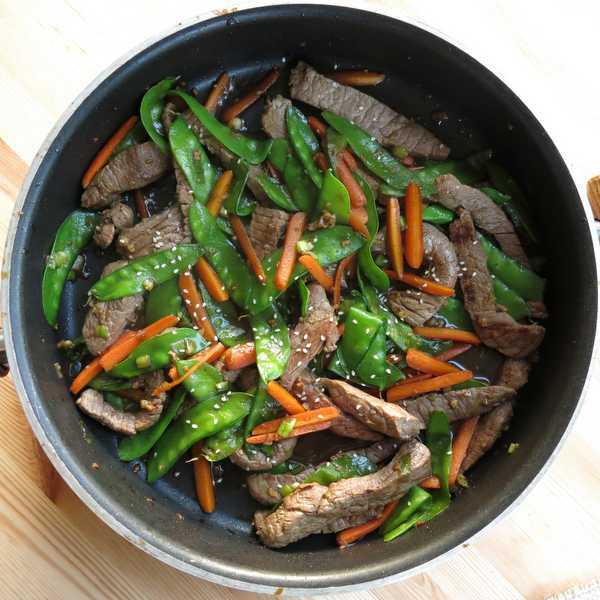 It’s a different flavor profile from Thai Beef Stir Fry, but the principle is the same. Thin sliced beef cooks quickly on the stove-top. Add fresh vegetables and a fantastic sauce and you’ve got a winner dinner. It’s one of our Quick and Easy Dinner Recipes. So long as you keep a few key ingredients on hand, this recipe will always be an option come dinner time. Beef is obviously pretty important. However, sesame oil, ground ginger, soy sauce or coconut aminos are the staples you need to keep in the pantry. Most grocery stores sell beef cut into thin slices for recipes just like this. The store may even call it beef for stir fry. Top round, skirt or flank steak work well. If you cut your own strips, be sure to cut across the grain which will make the meat more tender. Check out this article over at the Kitchn for pictures and a tutorial. You don’t have to own a wok to make this recipe! If you own a large pan, then you are golden. The key is to allow plenty of room for the meat and vegetables to come into contact with the heat! 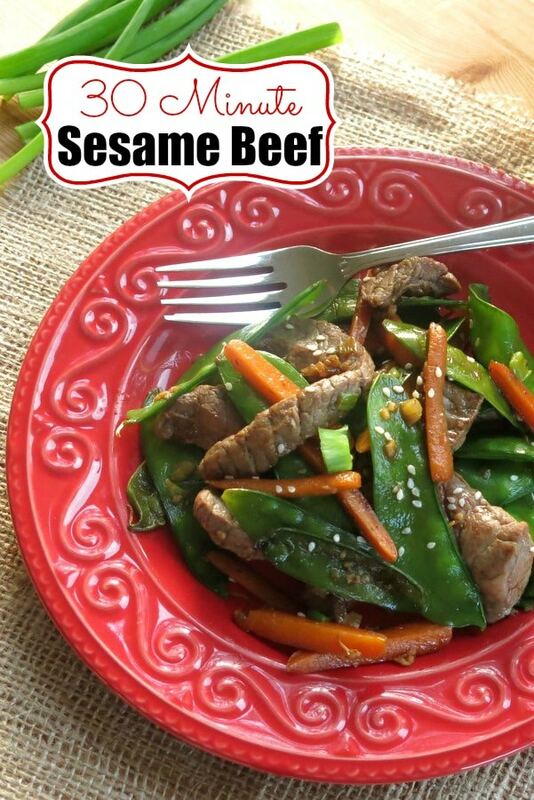 We use sesame oil to cook the beef because it can be heated to a high temperature and quickly adds flavor. The picture above was taken just before serving. The beef was returned to the pan with the vegetables. In my humble opinion, it’s the ginger soy sauce that makes this dish. If you’re not a fan of beef, it pairs well with many other proteins including chicken, pork and tofu. Yep. Tofu is fabulous! For many years I steered clear of Asian-inspired recipes and not because I don’t thoroughly enjoy them. 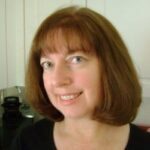 Rather, soy was on our list of foods to avoid due to a food allergy in the house and I found that ingredient very hard to replace…until I found Coconut Aminos. It is a one-for-one replacement for soy sauce that is also gluten-free. And, no, it does not taste like coconut at all. You can read more about it over in the Allergy Friendly Food Products guide. If gluten is an issue, then tamari is another option. I really hope that you try this recipe and make it your own! It calls for carrots and snow peas. But, use your favorites or what you have on hand. Other choices include broccoli, onions, chestnuts, peppers and mushrooms. If you make the recipe, please tag @DinnerMom. We’d love to see what you are cooking up! 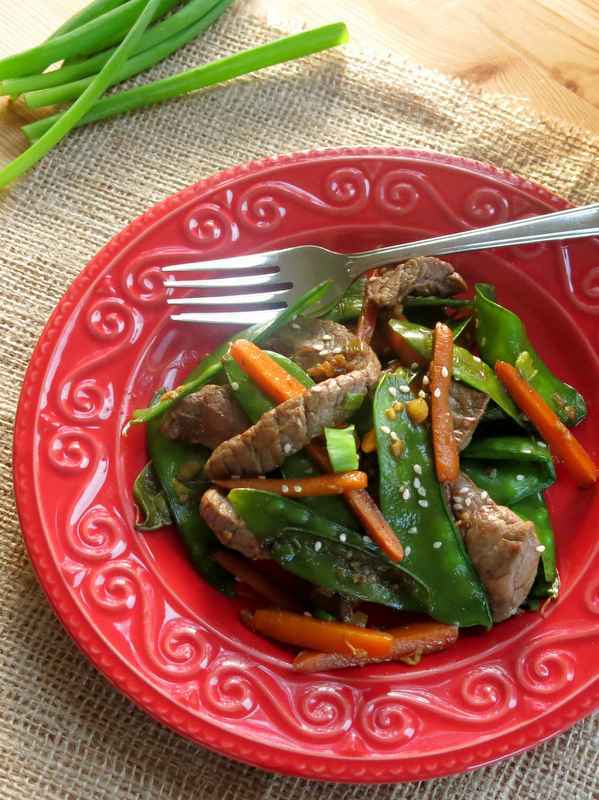 Lean strips of beef are seared in sesame oil and cooked with snow peas and carrots in a finger-licking good ginger soy sauce. A one-pan recipe that's ready in less than 30 minutes. Combine soy sauce (or coconut aminos,) sugar, garlic and ginger in a small bowl and set aside. Heat sesame oil in skillet over medium-high heat. Add beef to skillet in batches and cook for about 3 minutes or until browned and cooked through. Add vegetables, white parts of green onion and sauce to skillet and cook over medium high heat for about 5 minutes or until vegetables are crisp tender. Return beef to skillet and stir to coat with sauce. Top with remaining green onions and sesame seeds. Replace brown sugar with 2 teaspoons agave nectar and leave out carrots to keep recipe South Beach Diet Phase 1 compliant. Coconut aminos can be found in a health food store and are a good substitute for soy sauce. It's also gluten-free. Please check product labels. My kids loved this. We used broccoli instead of snap peas! Great recipe. Hi! The recipe serves 4 people, which is 4 ounces of meat per person. This looks great!I have to make this recipe real soon.Thanks!